Plunge into the politicking and military strategies of Ancient Rome. 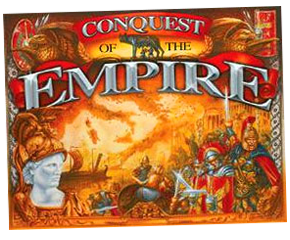 Conquest of the Empire by Eagle Games is a wonderfully strategic and amospheric mid-weight game. You’re thrown into the period of the Roman Empire, there to gather your armies to march on the provinces, attempt to control the Senate, and ruthlessly cut down your opponents through military might, alliances and treachery. If you have any interest in the period at all you’ll love this game. Eagle Games went all out to make a high quality product: the heavy box contains a huge 3.5 x 4 foot three-section map of Europe and Northern Africa, beautifully painted in antique style. It’s also chock-a-block with nicely detailed, large plastic pieces, thankfully not attached to sprues and already bagged. You get six sets in different colours of your Caesar, generals, infantry, cavalry, two-piece catapults and galleys, plus some generic cities and roads. There is also a deck of well-illustrated cards, a bag of large ‘gold’ and ‘silver’ coins (which are great fun to stack, or cast contemptuously across the board to an opponent), and several oversized—everything about this game is big—special dice. All this largess wouldn’t be much good without a rules system, and Eagle Games brilliantly hedges their bets by giving you two. The first ‘Classic’ set of rules is the original Milton Bradley Game Master series game from 1984 of which this is a reprint, with a few tweaks. I have yet to play this system as apparently it’s showing its age. The other rules booklet is completely new, based on another game called Struggle of Empires, and it works perfectly for the theme. The game is divided into four Campaign Seasons, during which players work out their alliances and turn order using a simple but clever bidding system, and complete other once-a-Season actions such as calculating Victory Points. But the heart of each Season is four rounds in each of which players get to choose two actions: either buy a Conquest card, move or battle their forces, recruit, raise funds, or buy Influence tokens to control Provinces. It’s this range of choices, and especially the limited amount of opportunities available to make them, that make developing a well-timed strategy so interesting. Victory Points are received by having Influence tokens in a Province, but of course you can’t buy them if a non-allied military force is there with you. Time for battle! The combat system is simple but effective; players roll a number of dice, adding dice if they have a general or their Caesar present, are defending a city, or if they have a relevant card. For each symbol on the dice that matches a piece in your army, you destroy an opponent piece. It’s basically the reverse of the Memoir ’44 system, where symbols indicate which opponent pieces you have destroyed. I’ve played this involving game with three and four players and it has been a great success; I can only imagine it gets better with the maximum six players. If you like a bit of strategy, high quality game components, just the right balance of luck, strategy, ease of play and complexity—and the thought of becoming Emperor of the Ancient Roman world—this game’s for you.